Acute lymphoblastic leukemia (ALL) arises from lymphoblasts within the bone marrow. Lymphoblasts differentiate into either immature T or B cells, which are the cells-of-origin for the two main subclasses of ALL, T-ALL and B-ALL. Zebrafish models of T-ALL have been used successfully for the past 15 years, as their haematological, immunological and oncological pathways are highly conserved in humans. However, despite the clinical relevance of pre (precursor)-B-ALL, as it is the most common paediatric cancer, zebrafish B-ALL models went unrecognised until very recently. Earlier this year, the Langenau and Frazer labs both published independent reports in the journal Leukemia detailing their discovery of zebrafish B-ALL models within pre-existing T-ALL models ,. Both groups used zebrafish expressing an oncogenic Myc transgene driven by the B/T cell-specific recombination gene rag2 promoter, which caused fish to develop ALLs. It was assumed from previous research that only T-ALL leukemias would develop in these models, but unexpectedly, both groups found a subpopulation of leukemias that were phenotypically and transcriptionally characteristic of B-ALL, or in one case, a mixture of B- and T-ALL (termed biphenotypic ALL). Where the two models differ is the species origin of the Myc transgene, and the genetic background of the fish – the Langenau group use a murine-derived Myc transgene (mMyc) and the Frazer group use a human-derived transgene (hMYC). Although these transgenes are highly similar, it raises the possibility that the leukemias generated by the two models might have important differences that could both undermine or expand their usefulness in modelling human ALL. In this preprint, the two groups show the results of their collaboration to validate, compare and contrast these B-ALL models at the transcriptional level. Happily, they confirm both models as driving B-ALL formation alongside T-ALL, and also find that unexpectedly, their B-ALLs originate from different B cell lineages, thus potentially modelling different subtypes of B-ALL. From Figure 1A of the preprint (under CC-BY-NC-ND 4.0). This is a PCA plot of RNAseq expression profiles from previously classified mMyc-induced ALL (blue, red and pink), and hMYC-induced ALL (black). The previously proposed hMYC T-ALLs (2, 6, 8-11, 13,14) cluster near mMyc T-ALLs (blue), proposed hMYC B-ALLs (3-5) near mMyc B-ALLs (red) and two hMYC ALLs (1 & 12) near the mMyc biphenotypic-ALL (pink). The identities of tumours within these clusters was confirmed by hierarchical clustering with the top 100 positively/negatively regulated genes, which showed that all T-ALLs expressed the same T cell markers, B-ALLs expressed B cell markers and biphenotypic/mixed ALLs expressed a mixture of these. Differences between the two models were revealed upon investigating the clonality and maturation of B and T cell receptors in hMYC and mMyc ALLs. Perhaps unsurprisingly, the T cell receptor tcrβ was expressed in all T- and biphenotypic-ALLs, but absent in B-ALLs. Interestingly, B-ALL leukemias differed in which B-cell receptor they preferred to express, with hMYC B-ALLs favouring the ighz form and mMyc-driven B-ALLs favouring the ighm form. Ontological comparison of genes uniquely expressed in T-ALLs, hMYC ighz+ B-ALLs and mMyc ighm+ B-ALLs, confirmed a transcriptional divergence between the two B-ALL types. Taken together, this suggests that although the oncogene driving B-ALL in both models is very similar, they appear to be derived from different B cell lineages. This is exciting, as it means that we have gone from being able to model just T-ALL in zebrafish, to being able to model three more subtypes of ALL – hMYC ighz+ B-ALL, mMyc ighm+ B-ALL, as well as biphenotypic ALL. The ‘Confirmatory Results’ is a new tag for me on Biorxiv.org, as most of the uploaded reports I’ve found so far fall into the ‘New Results’ category. With the rise in media coverage about the lack of reproducibility in scientific studies, it is good to see groups collaborating to confirm and build upon their research, and to make these findings accessible to everyone. 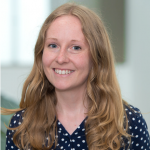 From a disease modelling standpoint, detailed characterisation and comparison of new models is important so we know how closely they recapitulate different facets of human pathologies. It will be exciting to see how these B-ALL models can now be employed to explore any differences in their molecular aetiologies and treatment responses alongside their T-ALL counterparts. It is intriguing that hMYC and mMyc transgenes give rise to transcriptionally divergent B-ALLs – are there any differences in tumour latency, aggressiveness and phenotype in general that could arise from these transcriptional differences? Do the different transcriptional profiles of ighm+ and ighz+ B-ALLs correlate with those arising from particular B cell lineages in patients? What are the key questions you want to address first with your B-ALL models? Borga, C. et al., 2018. Simultaneous B and T cell acute lymphoblastic leukemias in zebrafish driven by transgenic MYC: implications for oncogenesis and lymphopoiesis. Leukemia. Garcia, E.G. et al., 2018. Cell of origin dictates aggression and stem cell number in acute lymphoblastic leukemia. Leukemia, 32(8), pp.1860–1865. DL: By contrast, we favor a hypothesis that strain differences are driving the types of tumors that are favored. KF: Great question, we want to know that. One limitation is not much is known about zebrafish B cell development, which complicates equating individual B-ALLs (or the ighz+ vs. ighm+ B-ALL types), to distinct immature B cell stages. In human B-ALL cases, we can often figure out a “differentiation arrest point” for individual cancers, but we need to refine our understanding of zebrafish B lymphopoiesis in order to do that. A related problem is: What do the zebrafish ighz and ighm lineages really mean with respect to humans? In people, all B cells start out as IgM, and all naïve B cells (i.e., those not yet stimulated by antigen) are IgM+/IgD+. Then, in germinal centers, many B cells undergo “isotype switching” to lose IgM and become IgG+, IgE+, or IgA+. Based on how its immunoglobulin heavy chain locus is arranged, it seems isotype switching doesn’t happen in zebrafish. Rather, individual B cells must choose to be either ighz+ or ighm+ up front, so naïve B cells of both B lineages are present. IgZ has both cell surface and secretory forms, so in that way it resembles human IgG and IgA, but class switching in zebrafish doesn’t seem to exist, so it’s unclear where IgZ fits in. The bottom line is, until we know a bit more basic zebrafish immunology, I think it’s going to be tough to answer your question properly. DL: It is also clear that IgZ+ B cells represent an ancestral type of B cells that are not retained in human or mouse. KF: I’m not sure I agree with Dave, although he may be right. I think he’s correct that this is the prevailing opinion in the field, and I concur that IgZ doesn’t have a clear mammalian homologue, but I’m not yet convinced that this entire B cell lineage is lacking in mammals. Despite the limitations of comparing zebrafish to human B cell development, I’d still like to analyze several zebrafish B-ALL to see if we can use the expression of key gene ortho-/homo-logues to discern which B-ALL subtype each sample most-closely resembles. Depending how you slice the pie, pediatric B-ALL comprises ~10-15 different genetic entities, and expression patterns that distinguish them are well known. We should be able to use the RNA-seq data we already have to do that, but it’s been a bioinformatics challenge so far. Dave’s group pioneered studying leukemia-initiating/-propagating cells (which are just gentle ways of saying Leukemia Stem Cell) in zebrafish T-ALL. 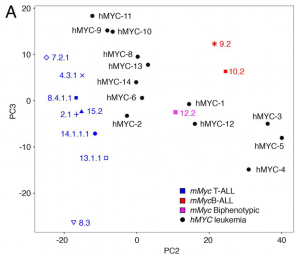 Independently, both our groups found these cells are much rarer in mMyc and hMYC B-ALL than in T-ALL. I have no good explanation for why, but I think we have the tools to investigate this. I’d like to know more about how drugs actually work in vivo, and zebrafish are great for this. Every type of Myc/MYC-induced zebrafish ALL responds to glucocorticoids—the backbone of human ALL therapy—but exactly what happens in vivo when these drugs work, and when they fail, isn’t fully known. We’re working to try to fill in those gaps. Like the Langenau group, we think we’ve found a couple hMYC biphenotypic ALL, and we’re interested in these ‘weird’ ALL. Mixed B-/T-ALL is exceptionally rare in patients, but B-ALL often ‘mis-express’ a few T cell markers, and T-ALL likewise often ‘mis-express’ B markers. This has kind of been ignored, I think, but maybe it means something. We know B and T cells derive from a common progenitor, so perhaps Myc/MYC-driven biphenotypic ALL is a cancer of this elusive progenitor cell population. Whatever biphenotypic ALL really represents, if we’ve inadvertently made zebrafish that get that disease, I’d be shocked if humans don’t get something similar.